This Man Lies On The Streets Of China, Begging For His Ex-Gf’s Forgiveness! Unbelievable! We all know for a fact that couples have various reasons why they are choosing to end their relationship with their partner. Some people claim that their partner has committed a mistake that could be forgiven but never be forgotten that’s why they chose to leave them behind. Now, a photo of a man and a woman is now circulating online and it has gained various reactions from the netizens! The photo shows the man who was holding tight on his ex-girlfriend’s legs and pleading her to not leave him behind and to just stay by his side forever. 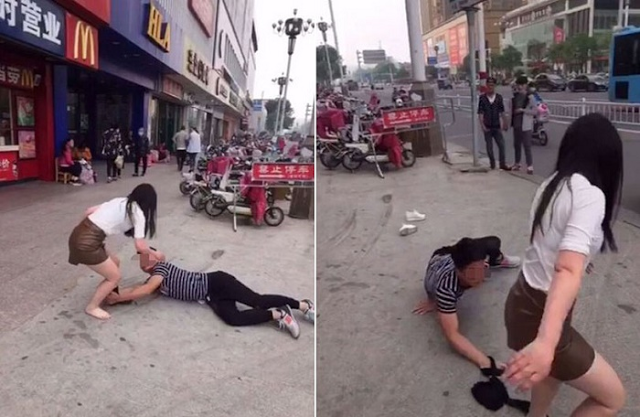 The said photo that was taken in China shows that the man was indeed begging the woman to get back in his arms. He did not feel ashamed to the fact that he was already lying on the floor, all he wanted that time was to be back with his girlfriend! The man did this for a long time. He was saying to the girl, “Please don’t leave me.” But even after the stockings of the girl was taken off, she still did not fall for the request of the man. He ended up being rejected as well. The girl did not give him a chance to be back together.